The National Examinations Board (NEB), Sanothimi, Bhaktapur has published the grade increment / supplementary result of Grade 11. NEB Grade Increment examinations was held from 14 Poush, 2075 (2075/09/14) and concluded on 22 Poush, 2075 (2075/09/22). 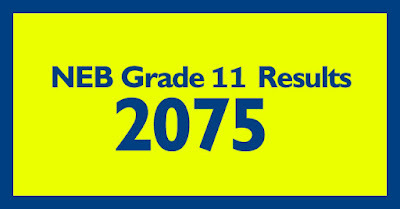 National Examinations Board (NEB) has published Grade 11 Results 2075. The examination of grade 11 was held on Baishakh 30, 2075 to Jestha 09, 2075. According to the notice published by the board, a total of 548,445 students appeared in the exam among which 332891 students appeared in regular examination whereas 176,049 students appeared for grade upgrade examination. Similarly, 39,505 students appeared in non-grading system examination. According to the NEB, one thousand one hundred 15 students have gained A + scoring 3.65 to 4 GPA whereas eight thousand nine hundred 49 students have gained A scoring 3 to 3.60 GPA. Likewise, 24 thousand five hundred 15 students have obtained B+ scoring between 2.81 to 3.20 GPA, 48 thousand seven hundred 31 students have obtained B scoring GPA between 2.41 to 2.80. Similarly, 86 thousand seven hundred 70 students have received C+ scoring 2.1 to 2.40 whereas 92 thousand five hundred 93 students have received C scoring 1.61 to 2 GPA. Total of 41 thousand four hundred six students have got D+ with GPA 1.21 to 1.60 and eight thousand one hundred 27 have received D with 0.81 to 1.20 GPA. Likewise, 20 thousand six hundred 85 students received E with 0 to 0.80 GPA. Students scoring 90 to 100 are given A+ while A to students scoring 80 to 89. Similarly, B+ to those scoring between 70 to 79, B to scores between 60 and 69, C+ to scores between 50 and 59, and C to scores between 40 and 49. Grade D+ will be given to scores in between 30 to 39 while D to those 20 to 29. Students scoring 0 to 19 are given E grade. Meanwhile, 15 thousand three hundred 33 students passed in the non-grading examination. Result of Grade 11 has been published in Grading System. A total of 548,445 students appeared in the exam among which 332891 students appeared in regular examination whereas 176,049 students appeared for grade upgrade examination. Similarly, 39,505 students appeared in non-grading system examination. The student who obtained Grade ‘D’ and ‘E’ can get a chance to give the complementary examinations on November 24 to upgrade their grade, according to examination controller Krishna Sharma. 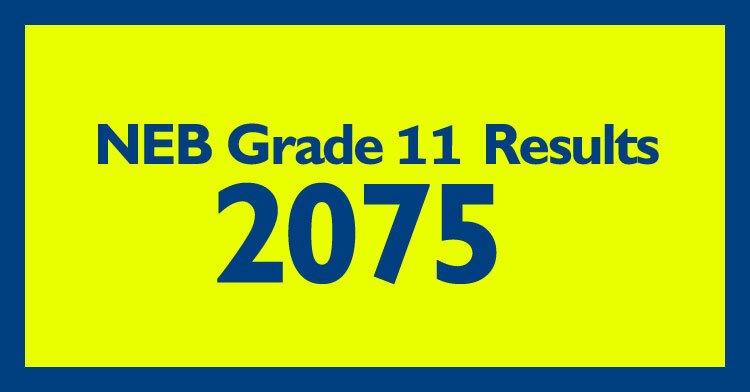 National Examinations Board (NEB) published results of Grade 12 for all faculties in both regular and partial side.Total 2, 99,675 examinees appeared in the examinations under the regular category, 41,375 have passed. Similarly, 35.2 percent have made through from the exempted category.This is the first time the result being published upon grading system.Out of 299,675 students appeared in the examinations under regular category, 1,169 students obtained 3.61 - 4 GPA while 11,221 students scored 3.21-3.60 GPA, 27,643 students got 2.81- 3.20 GPA. Similarly, 58,345 students received 2.41 - 2.80 GPA, 90,299 students scored 2.1 - 2.40 GPA, 66,438 students obtained 1.61 - 2 GPA, 22,734 got 1.21 -1.60 GPA, 4487 students scored 0.81 - 1.20 GPA and 999 students obtained 0.00 to 0.87 GPA.